Your pet will love the Coolaroo Foldable Dog and Cat Beds from Gale Pacific. Like the original Coolaroo Pet Bed, this new Foldable Pet Bed provides outstanding comfort and durability, but adds a collapsible, powder coated, steel frame making it easy to take your dog's favorite pet bed anywhere you decide to go. Simply fold the cot styled bed in half for quick and simple storage or travel. Coolaroo material is resistant to flea and insect infestation as well as to mold and mildew and comes with a three year warranty against UV degradation which makes it a terrific indoor/outdoor dog bed. Comes in a desert sand color with a dark brown finish frame. Now your four-legged family members can bring the comforts of home along on camping trips or just traveling to see grandma! This unique fold-up design allows you to set up your pup's bed in seconds, and it will fold up for easy storage and portability. Like other products, this Coolaroo knitted fabric is durable and resistant to fading plus being resistant to those pesky doggie odors. 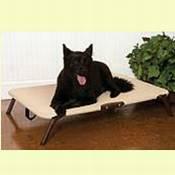 Your Coolaroo Foldable Steel Framed Dog Bed is very easy to maintain. You simply brush away the pet hair and other residues and then rinse the pet bed with a hose and allow it to air dry. So, your pet can enjoy this fine Coolaroo Dog Bed for years to come. This is a terrific portable dog or cat product to show your special "member of the family" just how much you care! Available in three sizes from small to large. Coolaroo dog beds come with a limited manufacturer's warranty. NOTE: This folding pet bed by Coolaroo has been discontinued. Please check out their other Raised Pet Cot Bed instead.